The starving boy in Uganda, 1980. 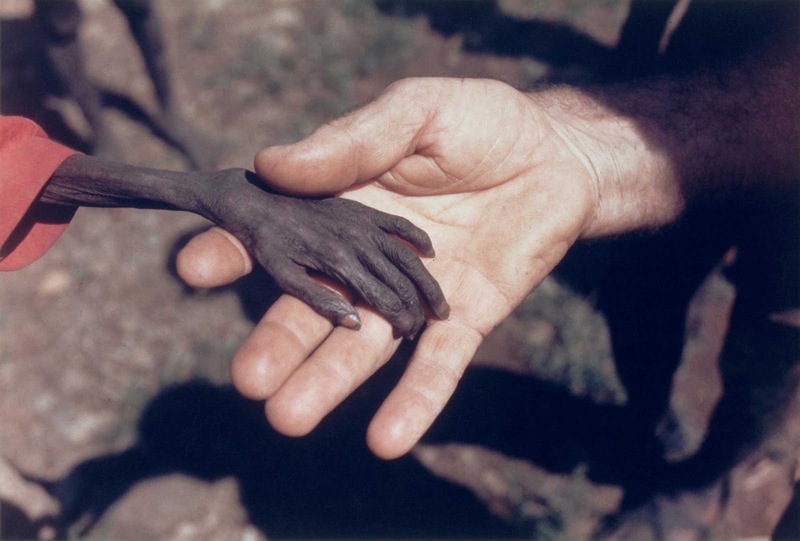 In 1980 Mike Wells took this powerful photograph of a Catholic missionary holding the hand of a starving Ugandan boy. In so many ways it almost looks like the hand is not human. It’s almost the hand of a space alien, a different species, or anything but the hand of a human being. Unfortunately it can’t be ‘willed’ into being something else, it is the hand of a human being. A starving human being. Freelance photojournalist Mike Wells explained to Holland Herald magazine, in an interview after winning the World Press Photo of the Year award, that in 1980 he was in Africa working for the Save the Children Fund of the United Kingdom, covering their anti-polio campaign in Swaziland and Malawi. Wells made this image while on a side-trip to Uganda, at a seminary where the Verona Fathers were distributing food during the early days of the famine. One of the monks described the situation to Wells and told him that the Karamojong boy was around four years old. Food shortages in Karamoja began in July 1978, after drought, crop failure, and plant disease. Not being a region of great economic or political significance for the Ugandan government, President Idi Amin’s administration took no action after being alerted to the situation that year. Following the overthrow of Amin and the flight of his soldiers in 1979, Karamojong warriors acquired a large quantity of guns and ammunition. The influx of firearms drastically shifted regional power balances and cultural traditions around raiding. It became dangerous to move in and out of Karamoja with cattle or grain. In addition, national insecurity caused a complete breakdown of trade. Families started to run out of food in early 1980. The situation became critical in May and the famine reached its peak in July and August of the same year. In July, the Verona Fathers in Karamoja appealed to the World Food Program in Rome for urgent assistance. Catholic missionary activities had begun in the region in 1933, with the Catholic Church providing relief assistance during periods of famine since the 1960s. The photographer Mike Wells, who would later win the World Press Photo Award for this photo, admitted that he was ashamed to take the photo. The same publication that sat on his picture for five months without publishing it entered it into a competition. He was embarrassed to win as he never entered the competition himself, and was against winning prizes with pictures of people starving to death. It's difficult to tell if their so called independences worked out for their own good, so many African countries that are still using colonial infraestructure, that suffered dictatorships and genocide of their own people, that currently are suffering explotation of their resources by countries like China, they seem that instead of going better have gone worse. With all due respect, their countries were doing just fine before imperialism. The colonizations are what led to chaos and dictatorships, not the countries regaining their independence. The colonizers starved these countries of their resources and took away their culture, religion, and way of life. Way to spin this around and blame the victims for the sins of the white men who enslaved them.